In Nothing But Trouble, a gripping crime thriller by bestselling crime author Kerry Wilkinson, DI Jessica Daniel has to protect the streets of Manchester from escaped prisoners – and those trying to hunt them down. Niall O'Brien is a veteran living on the edge of a run-down estate, refusing to sell his house to developers. He's the only remaining resident, alone and frightened by a series of break-ins. He's been threatening to shoot the next intruder but he can't be serious . . . what if the next person through the door is a police officer trying to help? Elsewhere, on a bright Manchester morning a vehicle screeches across a junction and wipes out a prison van. Two prisoners run for it, leaving the police to track them down. They don't have long to wait. Hours later, one of the escapees is hanged from a motorway bridge. Was he broken out solely to be killed, or is there something deeper going on? Meanwhile, someone's conning pensioners out of their savings and there are rumours that the bare-knuckle British middleweight title fight is coming to the city. DI Jessica Daniel fears finding herself in the middle of an all-out war, not knowing that the biggest threat might come from a frightened pensioner. The eleventh novel in the Jessica Daniel series from the million-copy bestselling author, Kerry Wilkinson. 4.0 out of 5 starsReally good read. 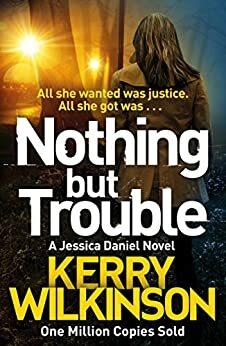 Nothing but trouble by kerry Wilkinson is a mystery and thriller read. DI Jessica Daniel has to protect the streets of Manchester from escaped prisoners- and those trying to hunt them down. Niallo O'brien is a veteran living on the edge of a run- down estate, refuses to sell his how to developers. Really good read with good characters. I liked the story and the characters. Little slow. 4* . I voluntarily reviewed an advanced copy of this book from netgalley. DI Jessica Daniel is having a busy day. Two prisoners escape in a smash and grab incident on the busy motorway network around Manchester. Soon afterwards one of them is found dead, hanging from a bridge over the M62. A lone pensioner fears for his personal safety and he is about to become the victim of a future crime..."He's called us ten times today and about a dozen times yesterday. He says people are breaking into his house but nobody at your end's doing anything. Sounds like a bit of a nutter to me....." There are rumours of an illegal bare-knuckled championship with the supposed appearance of British middleweight Champion Liam "nine fingers" Flanagan. There are fears of a gang turf war spilling over onto the streets of Manchester. Jessica's personal life is equally chaotic. She questions her relationship with colleague Archie Davey and the guilt she holds about fiancé Adam..."Jessica's fiancé Adam, was still in a coma, the doctors unsure if he'd ever wake up. She should be spending evenings at his side, not with another man..." She feels a responsibility to her lodger Bex, a young lady who Jessica rescued from a life on the streets. now facing the ultimate test when Bex's drug addicted mother makes an unwelcome appearance. The author does a wonderful job of controlling all these separate threads and presenting them in a very readable and exciting form. He most certainly writes with a certain flair and panache and I love the way he starts is book with a cliff hanger and ends in the same fashion. The conclusion in particular leaves a doubt over the future wellbeing of one of the central characters and ensures that the reader will return for the next exciting instalment. A bit like those old silent black and white movies with the heroine tied to the railway track! A great big thank you to the good people of netgalley for sending me a gratis copy of this book for a fair and honest review and that is what I have written. I most certainly will be returning for the future adventures of DI Jessica Daniel and in the hands of her creator Kerry Wilkinson that can only be a good thing as he matures and perfects his style.